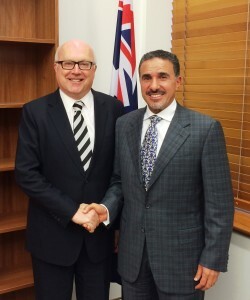 The Minister of Commerce and Industry Dr. Tawfiq bin Fawzan Al-Rabiah has arrived here yesterday evening to head the delegation of the Kingdom of Saudi Arabia participating in the meetings of trade ministers from the Group of Twenty to be hosted in Sydney on July 18-19. The Minister was received at Sydney International Airport by Saudi Acting Charge’ D’affaires in Australia Dr. Hassan bin Mohammed Al-Ansari, Saudi Cultural Attache Dr Abdulaziz bin Taleb and a number of Australian officials. 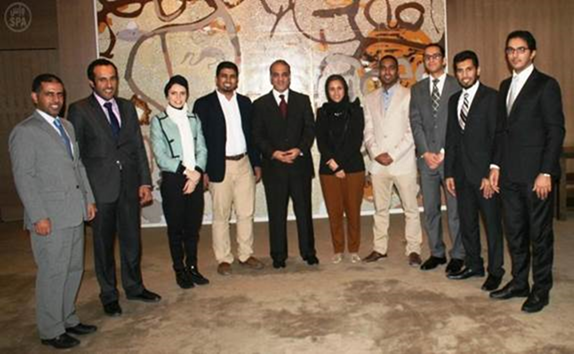 Saudi Acting Charge D’affaires in Australia Dr. Hassan bin Mohammed Al-Ansari has held an Iftar banquet in honor of the Saudi delegation participating in the G20 Youth Forum. 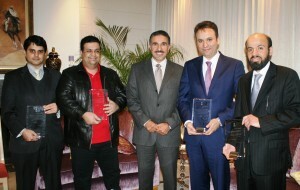 The banquet was attended by members of the Saudi embassy in Australia. Australian Foreign Minister Julie Bishop received at her office today Saudi Ambassador to Australia and New Zealand H.E Nabil Al Saleh. During the meeting, they discussed issues of common interest in addition to means of enhancing bilateral relations. 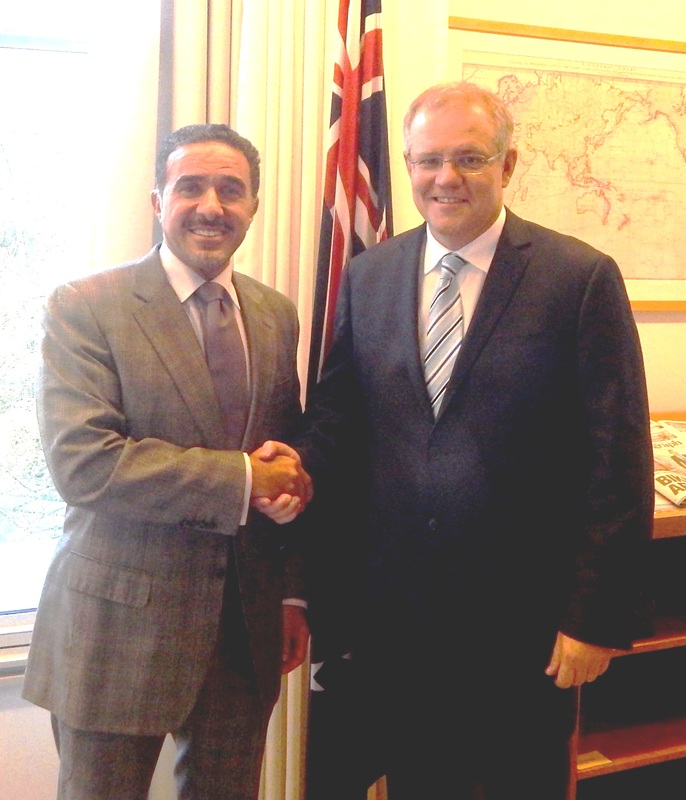 Australian Minister of Immigration and Border Protection Scott Morrison has received in his office at the parliament here Saudi Ambassador to Australia and New Zealand Nabil bin Mohammed Al Saleh. During the meeting, they discussed issues related to students on scholarships, their companions, residence and visas regulations, aspects of cooperation between the two countries and ways of enhancing them in all fields. The Australian Minister stressed his country’s desire for continuing coordination and cooperation with the Kingdom of Saudi Arabia in various fields. Australian Attorney-General Senator George Brandis met at his office here today Saudi Ambassador to Australia and New Zealand Nabil Al Saleh. 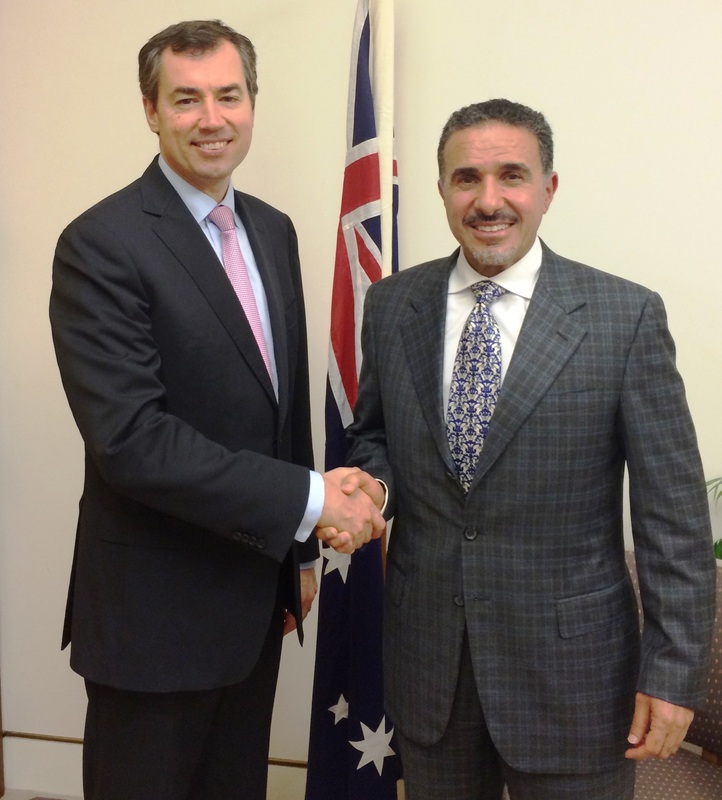 Australian Minister for Justice Michael Keenan received Saudi Ambassador to Australia and New Zealand Nabil Al Saleh. 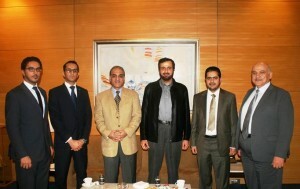 During the meeting, they discussed bilateral relations and ways to promote them in all fields. 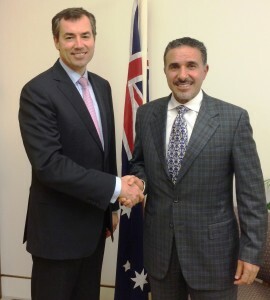 New South Wales Premier Mike Baird met with Saudi Arabia Ambassador to Australia HE Nabil Al Saleh During the meeting, they discussed bilateral relations and means of developing them to serve the common interests of the two countries. 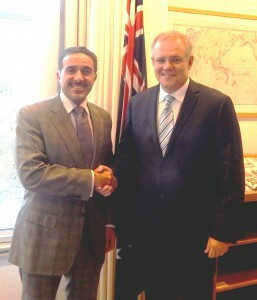 During the meeting, which was held on the sidelines of the annual celebration of the Australian Middle East Media, the two sides reviewed ways of strengthening relations between the Kingdom of Saudi Arabia and New South Wales State. For his part, Premier Baird commended the relations existing between Australia and the Kingdom of Saudi Arabia on more than one level, noting the role played by Saudi students who are studying in universities and institutes in New South Wales State to build bridges between the two friendly peoples. 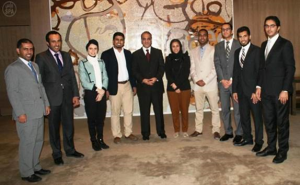 Saudi Ambassador to Australia and New Zealand H.E Nabil Al Saleh , has honoured a number of departing diplomats who have ended their tenure at the Saudi Embassy in Canberra, Australia . Amongst the departing diplomats include the Deputy Ambassador Faissal Hifzy, Second Secretary Mr Mohammed M Alyahya , Mr Khaled Alghamedy and Hisham Alfayez. The ambassador thanked the diplomats for their continued dedication and contribution to the Saudi Embassy in Australia and also wished them all the success in their new oncoming missions. He thanked them for their assistance in catering for the growing number of Saudi students in Australia and also in fostering postivite bilateral relations between the Kingdom of Saudi Arabia and Australia. For their part, the diplomats expressed their appreciation to Ambassador Al Saleh for his unconditional support and cooperation throughout their term in the Saudi Embassy in Australia.